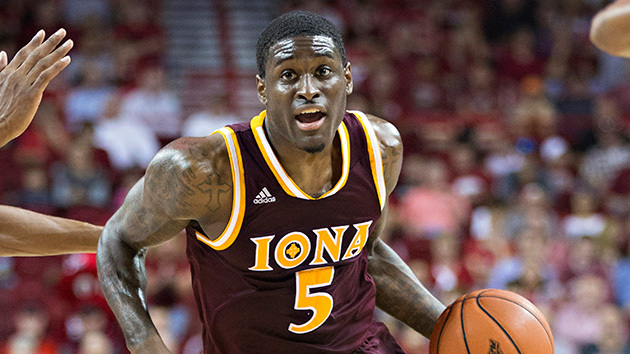 Everything you need to know about the Iona Gaels as they begin the NCAA tournament. The Case For: A.J. English is one of the best pure scorers in college basketball, and a legitimate prospect for the next level. He averaged 22.4 points per game, 10th in the nation. The son of a former NBA veteran by the same name, English can win a game all by himself. Like he did when he scored 46 against Fairfield on Dec. 1. Or his 20-point, 10-assist, 7-rebound line against Canisius on March 4. Or his six performances of 30 or more points, including two of 40 or more. The 6'4" English, a Jerry West Award finalist for best shooting guard in the nation, did this after recovering from surgery to fix a broken bone in his left hand that forced him out of five games in December. He might be the best player in Iona history. Yet the 35th-ranked offense is not just English. The 6'8" junior forward Jordan Washington averaged 13.8 points per game despite playing just 18 minutes a game. Sophomore guard Deyshonee Much shoots 45.0% from deep, which is 42nd in the nation and only a few percentage points behind player of the year frontrunner Denzel Valentine. That’s good news on a team that takes nearly half (44.2) of their shots from beyond the arc. Between Much, senior guard Ibn Muhammad (40.7% from three) and English, a few hot shooting nights can propel the Gaels into the Sweet 16. The shooting might be enough with their improved defense—in their last 13 games, Iona has given up just 68.5 points per game. They could be peaking at the right time. The Case Against: Washington is among the most efficient players in the NCAA, and he draws 9.2 fouls per 40 minutes. But he simply cannot stay on the court. He commits 8.12 fouls per 40 minutes—more than any other player in the major conferences but one. English and Washington are lethal, but they can’t be when the latter cannot stay on the floor for half a game, let alone major minutes down the stretch. And if Washington can’t stay on the floor, the Gaels will get killed inside. Their leading rebounder is a 6'7", 190-pound swingman in Isaiah Williams. They’re not just thin inside; they struggle to defend the basket in general. They rank 120th in adjusted defensive efficiency, are tied for 228th in points allowed, and that includes the last 13 impressive games. They give up a dangerous amount of threes—36.1 per game, and they rank 223rd in the nation in three-point percentage allowed. Beyond that, they have only two wins against a kenpom.com top-100 team—and both are against Monmouth, an average offensive team. They will have to shoot their way to victories in the tournament—and, well, you know the saying. SI Prediction: Beat Iowa State in the first round; lose to Purdue in the second round.